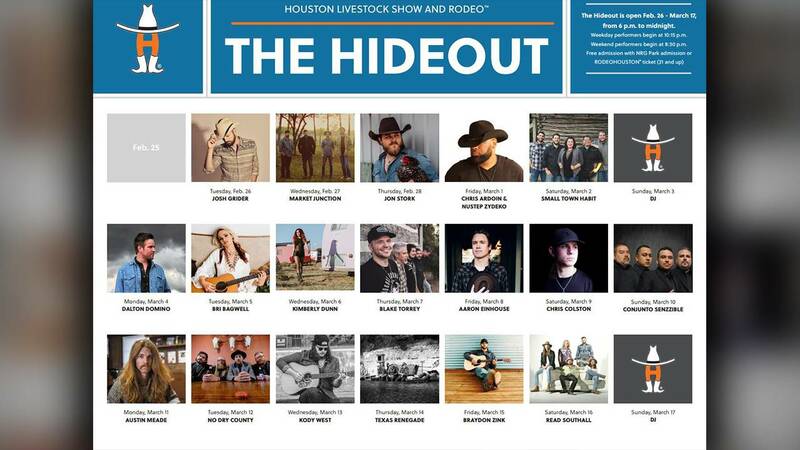 HOUSTON - The Hideout lineup at the 2019 Houston Rodeo has been released. The Hideout, which is located in a white tent on the west side of NRG Arena, is open from Feb. 26 to March 17 from 6 p.m. to midnight. Admission to The Hideout is free with NRG Park admission or a RodeoHouston ticket (21 and up). Weekday performers begin at 10:15 p.m. Weekend performers begin at 8:30 p.m.